There is one obvious deficiency of almost every Social Networking site – one that, if corrected, could make all the difference in their ability to generate an income and greatly increase their usefulness. 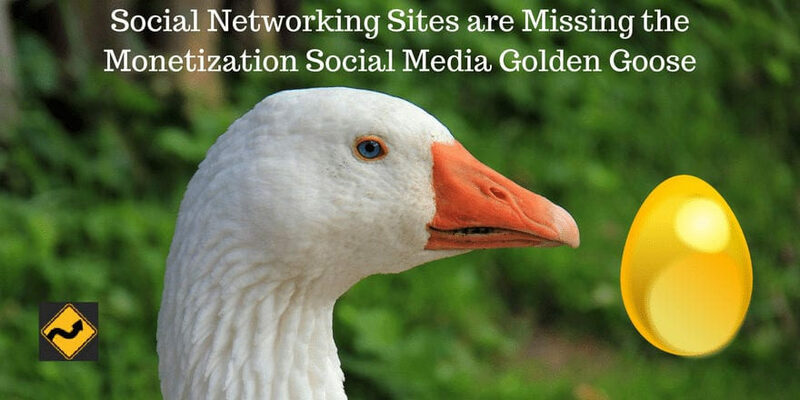 Monetizing social networking strategy is simple, but they don’t seem to see it. Better targeting is what is behind the calls for better filters, too much Twitter noise and pruning followers! Social Media sites are only useful to those who can figure out how to reduce the noise and hone in on their interests. Users are NOT who should be providing a targeted experience; the SOCIAL NETWORKING SITES ARE!!! Want to know how? It isn’t rocket science. It is a simple concept although there will be some complex behind-the-scenes workings required. There are many others like me who would be glad to provide input and volunteer as beta testers. Anyone else can ask me if they’re interested. While advanced users can find a way to use these services to create their own niche Twitter accounts or geo-target their reach the way I suggested in Find Twitter Users in Specific Niches and Locations, they simply shouldn’t need to do that. Computers are ideal for data mining and formatting the results for us! Feeds by Interest – instead of subscribing to users let us subscribe and share by interest. Whatever people love …offer http://Twitter.com/favorite interest where /favoriteinterest can be anything from fishing to jazz to Internet marketing. At Twitter, let us toggle between following individuals and subjects. Why not offer http://Twitter.com/favoriteinterest? Again, this can be any interest. You can offer advertisers what they want: an audience of potential buyers. Before anyone automatically starts screaming “no more ads” honestly ask yourself whether you would TRULY mind seeing ads that are specifically about what you are truly and sincerely passionate about. You can still tune them out. And – this is my favorite part – those ads will prompt opinions, recommendations, warnings and discussions about the products and services advertised! That will likely scare advertisers to death. They’ll have to get over it. There is no way they’re going to be able to control public opinion any more anyway – so they may as well learn to TRULY interact with us and start actually FIXING the issues that plague their businesses to increase Customer Satisfaction. Make it easy for others to find those recommendations of your favorite small business. Offer those small businesses that can afford it advertising targeted specifically to THEIR niche or their location. Being able to instantly find the latest Tweets on great restaurants in any city or town. Car breaks down while traveling? Check for trusted mobile mechanics ANYWHERE! Considering about buying that big ticket item? Don’t – until you see what buyers REALLY think! Doesn’t this idea sound familiar to some? This is exactly the same concept that made ppc advertising the cash cow it is. There is no reason Social Networking sites can not apply it just as well – or even better! When Twitter or any other Social Networking site starts offering a targeted experience with obvious consumer benefits they will eventually become as well known as Google is today. The only questions now are which one is going to step up and do it first and who is going to assist them to get it done. If Twitter don’t currently have the resources maybe they can recruit some collaborators. I know some brilliant people who were involved in the Overture startup. They might even Find Venture Capital or an Investment Angel to build such a system – there shouldn’t be any shortage of investors who wish they owned Google AdWords. I just hope they’ll keep it private and honest instead of taking the money and running. Isn’t there anyone who would rather keep the Golden Goose instead of letting her die after an IPO insisted on in an Exit Strategy? One more point: If I were the Social Networking site I would do one major thing different than ppc advertising does. I would focus on small businesses and not the Fortune 500 for my income. That tackle shop ad is far more likely to appeal to a fisherman than ads for Wal-Mart, eBay, and every other “we sell everything under the sun” corporate store. Was the explanation clear enough for you to completely understand what I’ve suggested? Would you like to be able to easily see all Tweets about your favorite subject or where you live? If there were links to small businesses related to your favorite subject would you consider visiting them? For example, if you loved fishing and there was a link for a coupon for a tackle store would that interest you? If you have a small business would you consider creating ads specifically matching your niche on Social Networking sites so your niche buyers could find you? How Twitter Could Monetize (Jan 5, 2009) These are NOT good ways IMHO; no wonder we hate ads! This post was originally published January 6, 2009; updated January 14, 2017. As of now, Twitter is still struggling to monetize. They have limited public search results which may indicate they plan to monetize by selling this now-private data to big business. Twitter has always seemed to focus on finding a way to get money from corporations while ignoring small business. As of August 30, 2016, Twitter is experimenting with pre-roll video ads. http://www.kenekted.com/ This is kind of what they’re doing. Might be worth a look. Great post! Social networking is not only for reconnecting with old friends but it can earn you money as well. I have subscribed to a number of social networking sites and maintaining these sites used to be just a favorite pastime activity for me. But after I learned that you can make money from social networking sites, I tried it and it turned into a full time job. Imagine earning easy cash out of doing something that you enjoy. I am on the quest for new networking sites I could join and expand my networking community. This post gave me an idea. Thanks! Of course now that the major question for many online companies is that of monetizing the resources they have, we will see new innovative approaches to making money off traffic and users everywhere. The recent example that definitely deserves noting as it offers a direct road to the bright future for quite a number of our favorite web projects is that of Reddit, the social news website. I agree ! Their method is Flaw and they have to make changes before other networks will and take their place . @jonhc Thank you for letting us know about Proximic. I’ve visited their site and shared it on FriendFeed and Twitter. I would love to see them gain widespread implementation across blogs and Social Networking sites. All sites will still have to provide targeted pages to display the ads on. The best targeted ads are manually selected and implemented. No algorithm, regardless of how sophisticated, can be as accurate as human selection. I suggest you look toward proximic for social networking monetization technologies. @Nicholas James Thank you for taking the time to comment on this post. Overture (now Yahoo! Search Marketing) pioneered the idea but Google is profiting most from it. Since it has already been done and proven to be where the money is it amazes me that no Social Networking site has seen the connection between how search ads are targeted and how they could do the same using ads on targeted pages. What Social Networking most needs (to make it easy for their users to find the content they want) is also what they most need to target and sell ads! I am very interested in offering feedback, suggestions and beta testing to FriendFeed and Twitter – or if they are not interested – to any other Social Networking site that will develop this idea. This is something that social networking sites haven’t taken advantage of, they haven’t realised the true value of the services which they are providing. This is reminiscent of when Google entered the Search Market. No-one saw the true value of Search but the Google guys, did. Search has now become the core service of users on the Internet. @Louis Gray – Absolutely! At one point StumbleUpon made it really easy to find the top Stumblers on any subject via tags – well easy if you knew how to access it. There were pages that showed which users posted the most favored content on any given subject and you could easily see what expertise any particular user had. That content was only a click away. If I wanted to find a Ubuntu expert I had only to go to the Ubuntu page and I could instantly visit and potentially contact the best Stumblers. Originally those features weren’t in StumbleUpon (and post-eBay I believe some were removed). Today they aren’t part of FriendFeed but they definitely CAN be added. Each of those pages brought in valuable incoming links from search engines and introduced more people to SU. While SU never monetized in the manner I am suggesting they certainly could have. A major piece in my note on Friday regarding FriendFeed was recommending topical summaries. How can I find out who the top folks are in sports, tech, news, you name it? Today, that’d be the search engine, but it looks like your thoughts are on the same lines.